On a little square, constrained by the Klausentor gate, you will find the "Markuskirche", sometimes called "Ursulinenkirche" by locals from Salzburg. At this site, one of the most terrible disasters in the history of Salzburg happened on the 16th of July 1669, when rocks and soil fell ran off the Mönchsberg mountain in an avalanche, killing 220 people. The victims of the disaster were buried at then nearby Bürgerspitalsfriedhof at the Blasiuskirche. There is no record of the architect in charge with the construction of the Markuskirche, but the design and structure of the building clearly point at Fischer von Erlach, whose masterpiece, the Kollegienkirche, is just a few blocks down the road. Previously to the disaster of 1669, there was a church and hospital of the "Barmherzige Brüder" monks, who now occupy the Kajetanerkirche and still run a hospital there. The rocks destroyed both hospital and church, and so the site was vacant when Prince Archbishop Johann Ernst Thun decided to found a school for girls in 1695. He ordered the Ursuline nuns with the establishment of this school and in 1699 the re-erection of a church on this spot started together with a court for the nunnery. The Markuskirche is the end piece of the nunnery building. The roof of the front façade is decorated with the Saints Markus, Ursula and Augustinus. The towers are set behind the façade. The antechapel contains wooden statues of four saints from 1700 and leads directly to the bright and friendly central hall. The interiors are dominated by rich stucco-work and fresco paintings, both by Christof Anton Mayr from 1756. Fischer von Erlach probably designed the altars; the main altar contains a painting by Johann Martin Schaumberger. The mighty and elaborately decorated organ was built by Matthäus Mauracher and his sons. The Ursula nuns do not use the church anymore; most of the nunnery building behind it is occupied by the "Haus der Natur" natural history museum. The nuns now occupy a new site South of Salzburg, where they still run a very respected and prestigious private school for girls. 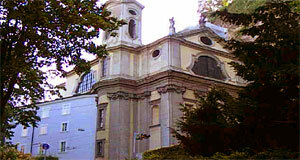 St. Markus is used by the Ukrainian-Catholic community of Salzburg. Another church built by Fischer von Erlach is the Trinity Church.